You should not avoid all milk and milk products. Milk and milk products help to keep your body and bones healthy and strong. This is because they contain nutrients such as protein and calcium. Even if you are lactose intolerant, regularly eating small amounts of lactose is good for you. It helps the bacteria in your large bowel break down lactose without causing symptoms. The following tips will help you lower your lactose intake, and make sure you get enough protein and calcium. You should be able to cope with a small amount of regular milk in tea and coffee, or a small glass of regular milk at the same time as having other food. If you want to have more than a small glass, use a lactose-free milk. There are many different kinds of lactose-free milks. These include lactose-free cow's milk, soy milk, rice milk and almond milk. You can buy these in supermarkets. Lactose-free cow's milk and soy milk are the best options. They contain a lot more protein than rice or almond milk. If you choose soy or rice milk, make sure they have added calcium. Some people with lactose intolerance can eat regular yoghurt. This is especially true if the yoghurt contains live bacteria and is higher in fat, such as a Greek yoghurt. The bacteria break down some of the lactose in the yoghurt. They also supply lactase, which helps your body break down the remaining lactose. If you can't tolerate regular yoghurt, use a soy yoghurt, coconut yoghurt, or almond yoghurt. You can buy these in the supermarket. Many different sorbets and soy-based ice creams are available in the supermarket. These are high in sugar, so keep them for an occasional treat. Hard and semi-hard cheeses contain either no or very little lactose. 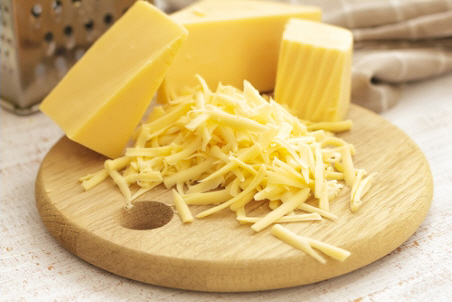 Hard and semi-hard cheeses include cheddar, edam, brie, camembert, feta, mozzarella, gouda, and parmesan. Haloumi cheese and soft, unripened cheeses that come in a tub contain small amounts of lactose. These include ricotta, cottage cheese, cream cheese, mascarpone, and crème fraîche. You should avoid these, or eat them in small quantities, such as two tablespoons or less. This makes the lactose pass through your gut more slowly, giving the lactase you do have more time to work. Whole milk (dark blue top) and Greek yoghurt are usually easier to tolerate than trim milk (green top) and low-fat yoghurt, because they contain less lactose and more fat. How much lactose can I have? Most people with lactose intolerance can drink small amounts of milk. Different people can have different amounts of lactose. To work out how much you can have, start drinking small amounts of milk. Start with ½ cup a day. If you cope with this, try having ¾ cup of milk a day and so on. Most adults with lactose intolerance can cope with 6 g of lactose or less at one time (6 g is the amount of lactose in ½ cup (125 ml) of whole milk). The following table shows how much lactose is in some common foods and drinks. Written by HealthInfo clinical advisers. Endorsed by Nutrition and Dietetics, Christchurch Hospital. Last reviewed August 2018. New Zealand Institute for Plant and Food Research and Ministry of Health. Concise New Zealand Food Composition Tables, 11th edition 2014.